“Devil’s Hole” connects the mouth of the Shade River with Forked Run Lake. 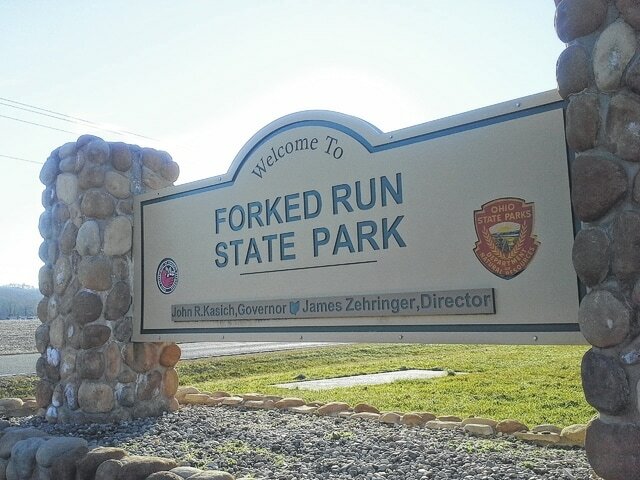 Forked Run State Park welcomes visitors. REEDSVILLE — The Ohio Department of Health (ODH) removed Forked Run State Park beaches from its website posting of unsafe beaches when the latest test results showed no indication of E. coli in the park’s lake. Forked Run’s lake was tested in early May and showed no signs of E. coli. A May 29 test had an elevated reading, requiring an advisory from the ODH. When the water was retested this week, levels were well under ODH requirements for safe water. Scott Kessler, Forked Run maintenance supervisor, was happy with the announcement. During the swimming season of May to Labor Day, public beaches are tested every other week to ensure the water is safe for swimmers. Many sources can cause the beach water to become polluted. Storm sewers, combined sewer overflows, urban, rural and agricultural runoff, malfunctioning septic tanks, industrial wastes, boating wastes, as well as human and animal wastes are a few of many contributors. The presence of E. coli bacteria in beach water is an indicator of pollution that could be potentially harmful to swimmers. When the amount of bacteria in the water exceeds state standards, beaches are posted with signs that advise against swimming. The information is also posted on the ODH website, where beach-goers can check postings before they head out to the state park. Forked Run State Park, located at 63300 State Route 124 in Reedsville, includes the 102-acre Forked Run Lake. With Friday’s announcement, swimmers may confidently enjoy the beaches. A clean-up is scheduled at Forked Run State Park near Reedsville on June 19 from 6-9 p.m. as part of Ohio River Sweep. T-shirts and food will be available to volunteers of the cleanup. More information is available by visiting www.orsanco.org/sweep or by contacting Todd Bissell at 740-444-1388. For more information visit http://parks.ohiodnr.gov/forkedrun#activities or call (740) 378-6206. Visit Beach Guard at http://publicapps.odh.ohio.gov/BeachGuardPublic/Default.aspx for information on any of the 134 beaches in Ohio.